In 1904, the A.C. 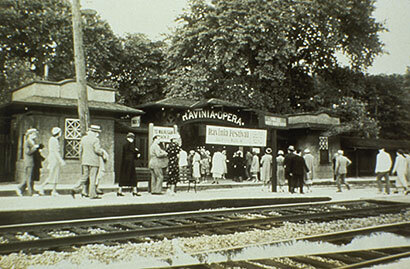 Frost Company created Ravinia as an amusement park intended to lure riders to the fledgling Chicago & Milwaukee Electric Railroad. The amusement park boasted a baseball diamond, electric fountain and refectory or casino building with dining rooms and a dance floor. The prairie-style Martin Theatre (then called Ravinia Theatre) is the only building on the grounds that dates back to that original construction. Over 100 years later, Ravinia Festival® is the oldest outdoor music festival in North America and is lauded for presenting world-class music. The festival attracts about 600,000 listeners to some 120 to 150 events that span all genres from classical music to jazz to music theater over each three-month summer season. Over the years, the festival has hosted such luminaries as Louis Armstrong, The Ballet Russe, Luciano Berio, Leonard Bernstein, Lucrezia Bori, Dave Brubeck, Pablo Casals, Van Cliburn, Aaron Copland, Duke Ellington, Ella Fitzgerald, George Gershwin, José Greco, Jascha Heifetz, John Houseman, Janis Joplin, Yo-Yo Ma, Luciano Pavarotti, Itzhak Perlman, Oscar Peterson, Stephen Sondheim, Isaac Stern and Frank Zappa. The first piece ever played at the park was "Bill Bailey, Won't You Please Come Home" on a steam calliope. Soon after, Walter Damrosch brought the New York Philharmonic to the open-air pavilion, which also saw dance productions by Ruth Page and Ted Shawn. This mix of popular diversions and music performances was not sufficient to keep the railroad afloat, and in 1910 the first incarnation of Ravinia Park came to an end, and the property went into receivership. A group of North Shore residents, convinced the high quality of presentations should continue, purchased the park and founded The Ravinia Company under the leadership of philanthropist Louis Eckstein, who served as impresario and personally subsidized the organization for 20 years. With a gala reopening in 1911, Ravinia became primarily a summer venue for classical music. 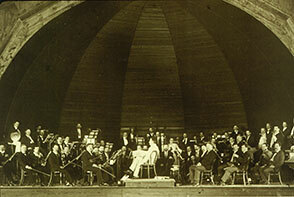 Opera was added to the concert programs in 1912, and by the end of the decade, Ravinia earned a reputation as America's summer opera capital. During Ravinia's "Golden Age" of opera, 1919 to 1931, Ravinia audiences heard the greatest singers in the world, including such luminaries as Edward Johnson, Giovanni Martinelli, Claudia Muzio, Rosa Raisa and Tito Schipa. In May 1949, the original wooden Pavilion burned to the ground. With the onset of the Great Depression, that Golden Age ended, and the woods fell silent for five years. Again, local businessmen came to the rescue by forming the Ravinia Festival® Association, a not-for-profit organization dedicated to presenting music of the highest quality for less than cost. In 1936, Ravinia became the summer residence of the Chicago Symphony Orchestra, which remains the centerpiece of the music festival today. In 1944, Eckstein's widow donated the 36-acre park to the Festival Association. 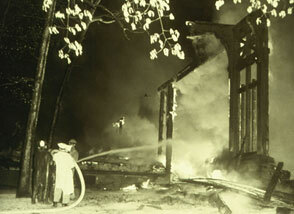 In May 1949, the original wooden Pavilion burned to the ground. Six weeks later, the festival opened on schedule without missing a single performance under the shelter of a 33-ton canvas cover, which was originally designed to hangar B-29 bombers. After the season, construction began on a new Pavilion that doubled the audience capacity. Seiji Ozawa was named Ravinia's first music director in 1964. Four years later, pianist Edward Gordon was appointed executive director, and the Festival began to grow in new directions, including the creation in 1988 of a professional studies division, the Steans Music Institute. Concert opera performances returned, and the park facilities were extensively renovated in 1970, with a new stage floor designed by legendary choreographer George Balanchine. In 1971, James Levine, who first conducted at Ravinia as a last-minute replacement, succeeded Ozawa as music director four years before becoming music director at the Metropolitan Opera. Among his most memorable seasons was a summer in which he programmed all of Mahler's symphonies. He headed Ravinia until 1993, helping Gordon, and later, Zarin Mehta to transform Ravinia® into a festival in the fullest sense of the word. Mehta, former general manager of the Montreal Symphony, was named executive director in 1990 and later became president and CEO of Ravinia Festival®. Internationally acclaimed conductor and pianist Christoph Eschenbach was named Ravinia's third music director in 1994 and served in that capacity through 2003, helping to shape the summer's programming in addition to conducting and performing at Ravinia. Eschenbach became an active mentor, teaching master classes at the Steans Music Institute and leading many young artists to their solo debuts with the Chicago Symphony Orchestra. Welz Kauffman was named president and CEO of Ravinia Festival in October 2000. Building on a career as an arts administrator for major organizations from coast to coast, Kauffman quickly established himself as an innovator able to bring to Ravinia ambitious music rarely heard in a festival setting, including numerous premieres and commissions. He established a pipeline from Chicago's enormous talent pool to the stages of Ravinia and forged new relationships with the area's major arts organizations. As architect of Ravinia's lauded music theater initiative, Kauffman sought to recognize the talent of composers who have contributed to this uniquely American art form. From the beginning, the music theater initiative touched every aspect of the Festival by expanding Ravinia's community outreach efforts; creating a new music theater branch of the Steans Music Institute; and focusing on the vital role of the orchestra in music theater through the Sondheim 75 series. He also introduced the cabaret series Martinis at the Martin: The Great American Songbook, which celebrates America's masters of popular song.